We got our yellow/orange Nihola around the 1st of May 2012. I don't know how far we've driven it, but it didn't start getting intensive use until the middle of September 2013, when it was fitted with an Olso-appropriate gearing system. Since then, the front brakes have seen serious use most days of the week. I think few Niholas ascend or descend a hill so steep, in their entire service lives, as the hill that ours does each working day. As the weeks passed, it became clear the brakes were getting a lot weaker. Almost certainly, the cause was the cables stretching (but the drum brakes can also wear). So, the question is, how does a person tighten the front brakes on a Nihola? The brake lever has no adjustment. 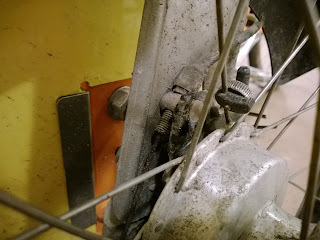 Down by the wheels, each brake has what appears to be a standard Sturmey-Archer drum brake cable adjustment mechanism, but its hard to access and nearly impossible to adjust. Its also partly covered by a rubber part presumably designed to keep water out, which is itself hard to get out of the way. On a normal bike, those would be the only two options. 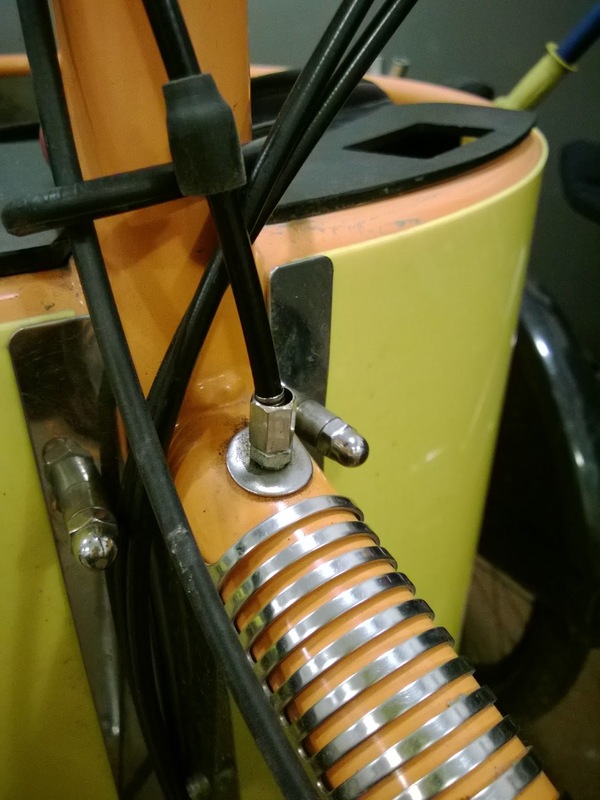 On a Nihola, however, an adjustment can also be made right above where the single cable from the brake lever is split into left and right cables for the brakes. Two 10mm wrenches take care of the problem (although its not as nice looking once the little rubber cap is too high to cover the threads).